Bo is back! In her second adventure, she and newly adopted younger brother Graf set off with their papas (gold prospecting partners) for their new home at Iditarod Creek. Unlike Ballard Creek, this new town is heavily populated, but has few children. Houses are moved from place to place as necessary to facilitate access to gold, and there are loud dredge machines that make frightening noises. Though Bo misses her old friends, she makes the best of her new experience by getting to know all the interesting people around her, including a mysteriously sad boy who might be in trouble. This book is fascinating. It includes information about gold prospecting, Eskimo culture, relations between people from different racial and cultural backgrounds, and the nature of adoption in this specific time and place. There is lots of discussion about language - off-color words to describe others, differences in language even among people from the same culture, even what to call a couch (or divan, or sofa). Interesting details reveal what it was like to get an education at home, and how adults could grow up without ever learning how to read and write, only to be taught later by their own children. Words seems to be the main focus of the story, and the message about their power comes through loud and strong. Unfortunately, some of the language itself makes it hard to know who will - or should - read this book. 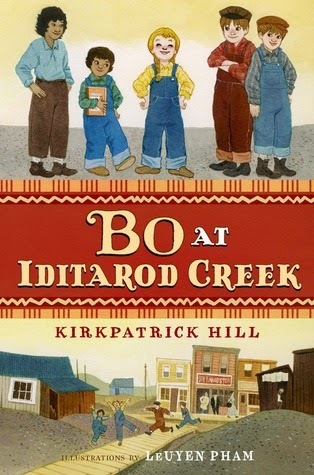 Certainly the first story about Bo would make a fine read-aloud for even a preschooler, but this second book uses racial slurs in confusing contexts (sometimes as insults, sometimes as nicknames) and it throws around the "b word" in a playful way without ever really explaining what it means or why it might not be okay for Bo - or other kids her age -to say it. I fully believe that these details are accurate for the time period and the nearly childless male dominated environment Bo and Graf are living in, but I would still hesitate to read these words out loud to my child. If I were looking for a way to have a specific conversation about sensitive language, this book might help me do that, but if a mom picked up this book unwittingly based on her child's love for the first one, she might find herself faced with some uncomfortable discussions she was not prepared for. Also possibly troubling to younger audiences would be the abuse of Renzo, the boy who Bo's family befriends and helps. There aren't many details, and they are mostly filtered through Bo's optimistic and innocent point of view, but the thought of a young boy nearly freezing to death in a piano box could be troubling for very little kids. I liked this book very much, but I feel like my book talk of it for a parent would be more of a warning label than a promotion of the book, because it is so deceptively mature in content. I, too. Was unsure what happened with this one! That said, the first one does not check out at all at my library despite multiple book talks, so I'm not buying the second. Do love the illustrations, though! Have you seen Snyder's Any Which Wall with the Pham Joe and Beth Krush type illustrations?